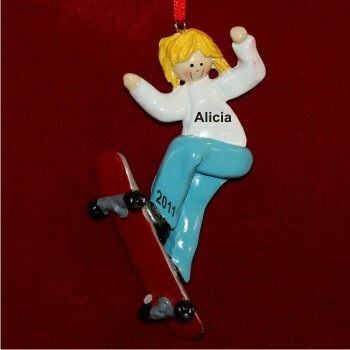 If your gal loves riding the half-pipe, getting air over jumps or doing her favorite tricks, she'll love the blonde girl skateboarding personalized Christmas ornament in a very stylish design. We customize these skateboarding ornaments personalized in an attractive font with her name and the year. Extras include a display cord for hanging these kids ornaments just about anywhere and our plush and pretty velvet gift pouch that's great for storage too. Encourage her to go for it with skateboarding girl blonde hair personalized Christmas ornament that lets her know you think she can ride with the best of them! For tomboy great-granddaughter Dec 31, 2014 Lenora I.